All the costumes predominantly RED, the color of LOVE, Each section gives tribute to things we love. "Island Vibes", For the love of ....the material things we crave "Precious Jewels," For the love of ...the intangible qualities we yearn for "Beauty & Elegance" For the love of .... battles fought "Freedom", For the Greatest Love of All .... our Children "Joy and Happiness"
A series of interactive workshops on the calypso art form, hosted by Mas Makers Massive in collaboration with Carnaval San Francisco and the Alliance for Cultural and Traditional Arts. The date of the symposium coincides with Carnaval San Francisco and and will support our to be held at Laney College Theatre, 900 Fallon Street in Oakland. “Tamboo Bamboo to Steelpan” –An examination of the roots of calypso in drum dance songs, stickfighting and other folk traditions and how rhythms were incorporated into music once African drums were banned. 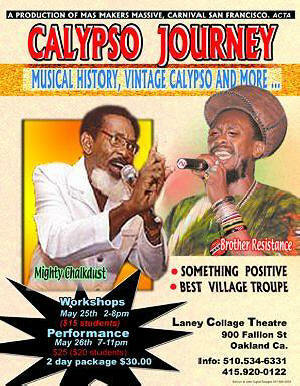 Few calypsonians are as immediately recognizable as "Chalkie"